After seeing several threads on weathering recently, I decided to take a quick break from my track realignment and attack a couple of cars. Only to see if maybe I can help shed some light on how I weather and to put away the notion that an airbrush is NEEDED for weathering. NOT saying it can't be used, but that you don't need one. 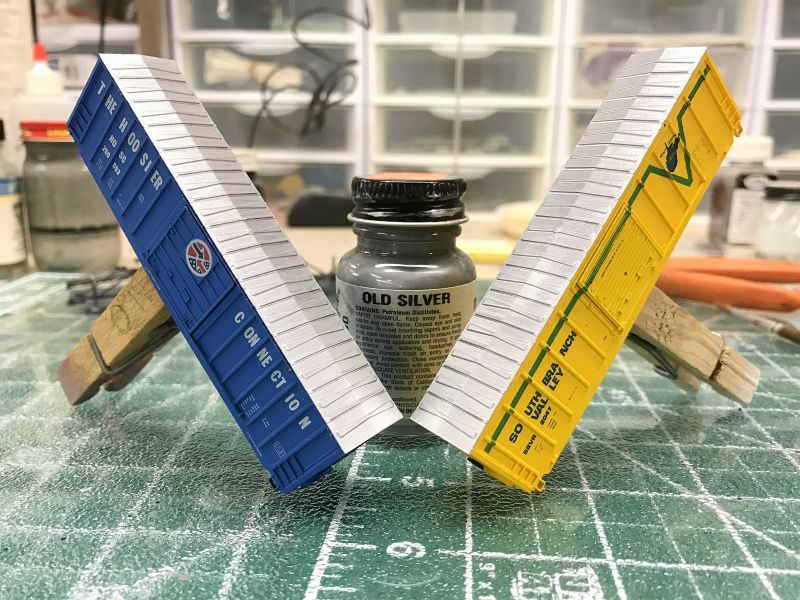 1) While I say "NO" airbrush, I do use one during my process, but that is ONLY to apply a clear flat coat to seal the original factory paint and then to seal each layer of weathering. When I'm finished with the layers I'll also spray a final coat of flat sealer to lock everything into place and to protect it. This can ALSO be done using a "Rattle Can" (aerosol can). Any actual paint, powder or chalk will be applied using a brush or sponge. 2) This is how I do it. This IS NOT the only way to do it. There are a multitude of methods to achieve any desired results. This is what works for ME. 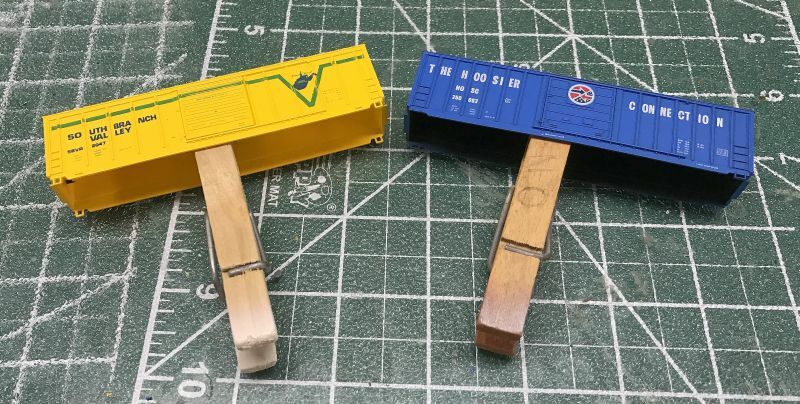 After getting a couple of my bridges glued up I set them aside and dug out a couple of older MDC boxcars, one light, one dark. These are brand new cars. The first thing I did was to give both cars a silver roof. I'm not a fan of colored roofs. I grabbed a bottle of Floquil "Old Silver" that was sitting on the bench. 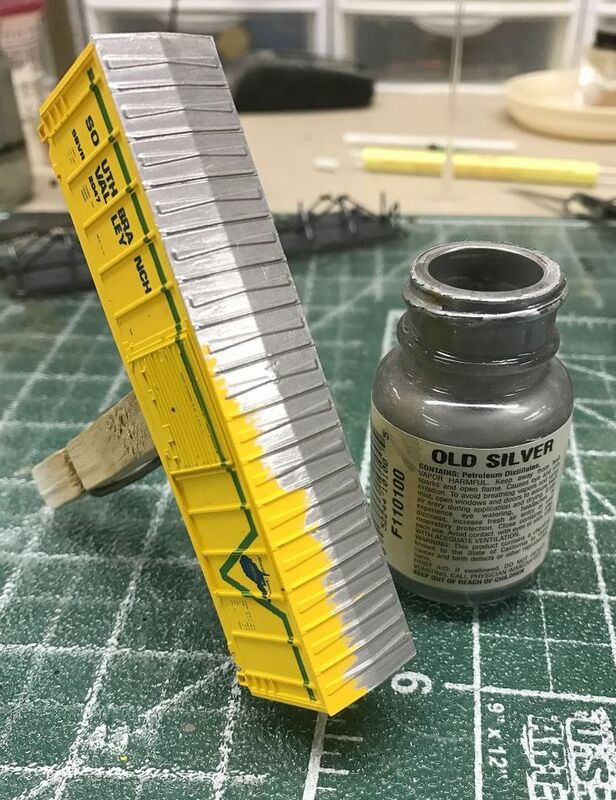 Any silver color will work, it can be Solvent based or Acrylic based, doesn't matter as I will seal it before I begin weathering. Once the paint was dry I gave them both a liberal coat of Dull Coat. 1) It seals the factory paint and the new roof paint I applied. 2) Most importantly, it gives the surface some "tooth" so as to give the paint and the powders or chalks something to grab to during the process. 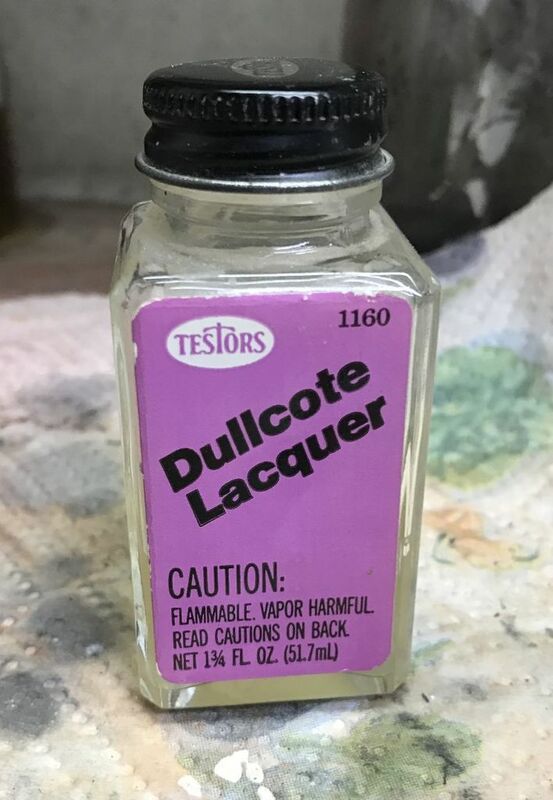 This is the Dull Coat I use when I airbrush it on. I'll thin it about 30% thinner to 70% Dull Coat so it flows better through my airbrush. Now remember, I stated you can ALSO use a Rattle Can in lieu of an airbrush. Now I'll let these cars dry overnight, this allows the sealer coat to fully dry. Next comes the FADE coat. Last edited by Allen H.; 18th Nov 2016 at 09:31 PM. This should be fun to watch. Thanks for sharing. Thank you Allen for taking the time to demonstrate this process. Going to definitely try this. Awesome! Thanks for writing this up, @Allen H.! Thanks Allen, and hopefully this will become and article as well. I've used your technique based on questions you answered for me earlier, and I think it works great. Ok, you got our attention....we want more pics! OK, on with the second video. This one has no music, sorry, just me rambling away for about 28 min. Please forgive my oration, it is not my forte and I am not a speaker. In this vid I will be showing the application of the Burnt Sienna which will replicate a rusty tone or rusty coat. As I say in the video, I am just preparing the base coats for the cars. If you think they look good, you can leave them when you're done. If not you can keep going with more layers, more rust build up and add scratches. While I'm doing this on Boxcars, this method should work on most other cars as well. 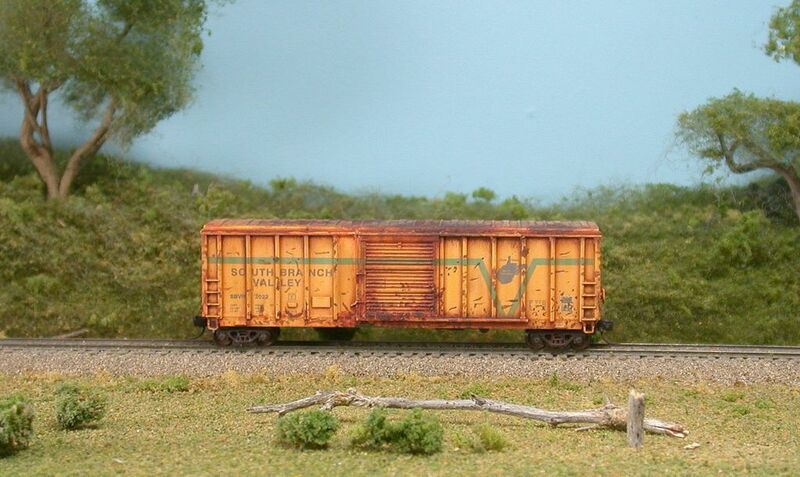 Some cars like tank cars may need a different type of weathering due to the nature of the car and the use of the car. Which is why I'm using the same car and road name. A couple of things before hand. The white wash effect on the two cars have been sealed and dried. They ready to cover. While I use Burnt Sienna, other colors can be used. Even try mixing some colors. I chose these colors as my base coats because they are what I was told to use and what I have seen others use, and they have worked for me. Certainly there is no reason to stick with these colors, and no reason not to try other colors. Experiment!!! Then post what you've done please. I haven't yet moved away from boxcars fully as there are so many things I've seen that I want to try out before moving on other cars. I have never paid attention when in position to look at car roofs but do the full sized box cars have silver roofs ? Or do you paint them silver to bring out the color of the weathering ? And thanks for making the videos. In this case I painted them to help show the weathering. I prefer silver roofs. Some are painted and some are not. I would think depends on several things. I'm betting they were painted early when costs were not a factor. Later with the cost of labor and materials rose, I would guess they just used aluminum or galvanized roofs. If you look at the cars from IMRC and/or FVM, some of them came with silver roofs and you can see a trace of overspray paint around the edges of the roofs, which suggests that the roofs were not painted on some cars. A lot depends on the customer whether they wanted them painted or not, and the cost associated with it. I'll be uploading the third one tonight. I tried this technique today and I am very pleased with the results. It is rather intimidating to smear paint over a prized car, but the Q-tip method works well and you have a lot of control as to how much you leave on. Oil paints are very forgiving compared to acryllcs. This car needed a dirty fade and the first application of burnt sienna looks very good to my eye. I would prefer to weather prior to assembly, but it was not possible with this car. Thanks Allen for the impetus to get me to try this. It is easy to do, uses minimal materials, and you really can't go wrong. A great combination! Another attempt, this time with burnt umber. I had pre-faded the paint with zinc white airbrushed on and tagged and patched accordingly. This car came from a friend and needed a little TLC, but now it looks down and dirty. The oil paint really helps to blend the graffiti. The burnt umber is easy to get too heavy, I think. I felt that way a bit about the examples in your video too, but it might just be my preference. I need to get some white and other colors to see what is possible. Those look real good with just the one coat! You're absolutely right, it's a very simple and easy process that gives you lots of control. The only drawback is you have to wait a little bit longer for the coats to dry, but I'll gladly give that up in return for the ease of application and the time you get to re-work any spots or areas. I really like how you left some of the coat heavy up under the roofwalks. To me that just helps to convey a place where not even mother nature can get it clean. Yup, the Burnt Umber can be dark, but like I said, no reason not to try mixing it with a lighter color like white or off white or even a beige? Or even with a color that's close to the original paint. No real reason to have to put on multiple colors either, just depends on how you want the car to look. My process is how I plan to weather my entire fleet, but with varying amounts of fade and colors. Thanks Allen. I agree, different approaches will give variety and that will look quite natural in a train. I'm going to pick up some white and maybe raw sienna and raw umber. They should be good for dirt, I think. I am also keen to try the fade with white. One thing that I found was that this method was very good for making subtle streaks from rust and dirt. These are impossible to do by hand, but they are a natural result of selectively removing paint and keeping some areas with a little more. I'm really happy how they interacted with the graffiti. I wanted some fade to the graffiti so it was more subtle and this technique is great for blending. LOVE THIS THREAD!!!!!!!!!!!!!!! thank you so much for posting it.. I will watch that video more than once I am sure!! By 0pti0n in forum Layouts, Design, & Planning.